Still more than any other creation for the genre, mention of the title of Swan Lake conjures in our mind’s eye what ballet is all about: the transformative power of dance, turning human beings into something that is not of this world; the very definition of fantasy. A prince, Siegfried, comes of age and must select a bride. But the one he chooses is held under a curse: every day Odette must become a beautiful white swan. The prince is warned that if he kills the spirit responsible, he will never be able to break the spell. Then at a ball to celebrate his birthday, the spirit, Rothbart, tricks the prince into falling for his own daughter, Odile, the mirror image of the woman he is now in love with. Originally staged by the Bolshoi in a version created by Julius Reisinger that is very different from that seen today (for example, Odette's ability to change into a swan is a source of protection granted by her grandfather rather than a curse placed upon her by the sorcerer, von Rothbart), Swan Lake was first performed in Moscow on 4 March 1877. The death of its composer, Pyotr Ilyich Tchaikovsky, galvanised Marius Petipa and Lev Ivanov into reviving Swan Lake and their interpretation, far closer to the narrative we now know, was premiered on 27 January 1895 by the Russian Imperial Ballet in St Petersburg. Over the next sixty-nine years, there were many revisions to the work including, during the Soviet era, the authorities’ insistence that Swan Lake have a happy ending. Then came Rudolf Nureyev. 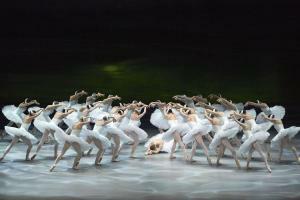 The iconic dancer and choreographer first created his Swan Lake for the Wiener Staatsopernballett. At its premiere on 15 October 1964, such was the reaction to his performance that he and his dance partner, Margot Fonteyn, were called back to the stage eighty-nine times to wild applause from the audience. Nureyev had stamped his mark on the ballet by elevating Siegfried’s role to the equal of Odette’s but as was typical of Nureyev, he hadn’t finished there. Some twenty years later, as director of the Paris Opéra Ballet, he created an entirely new scenario for Swan Lake. Premiered at the Palais Garnier on 20 December 1984, everything that happens is cast as a dream, a reflection of the prince’s anxieties as he moves from adolescence to adulthood, changing Swan Lake from a period piece into a fascinating exploration into the realm of the subconscious mind. Now Nureyev’s Swan Lake returns to the Wiener Staatsoper, the scene of his very first triumph in the country that would become his adoptive home.